Light Bulbs With One lit Up Leadership PowerPoint Templates And PowerPoint Themes 0912-"Microsoft Powerpoint Templates and Background with light bulbs with one lit up"-"Light bulbs with one lit up, leadership, teamwork, light bulbs, success, business" Energise your thoughts to fever pitch. Get them bubbling over with our Light Bulbs With One Lit Up Leadership PowerPoint Templates And PowerPoint Themes 0912. 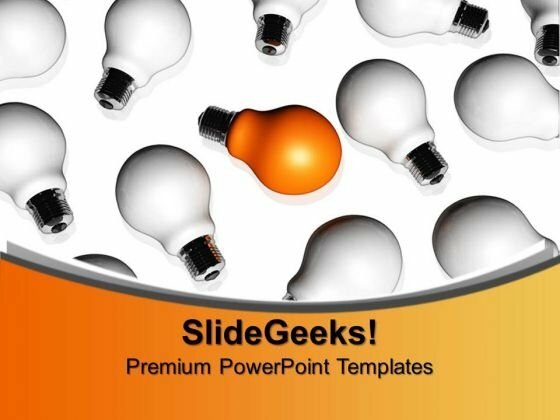 End all differences with our Light Bulbs With One Lit Up Leadership PowerPoint Templates And PowerPoint Themes 0912. They encourage achieving consensus.